Have you spent months this year on a major new home renovation, bathroom or kitchen remodel? The flooring, cabinetry, lighting and walls are complete, but somehow your space doesn’t speak to you or exude your personality. It is adding the final finishing touches that will make your space speak to you and bring it to life. I enjoy all phases of a design project. Ideally, we start from the ground up, making sure the plan of the space is cohesive and functional, and then finished with stunning materials, and furnished with gorgeous furnishings. Accessorizing is the crucial phase of completing a space properly and it is very often overlooked. Rugs, artwork, collectibles, pillows, and mirrors are some of the key elements that will bring your beautifully finished space to life. One of my favorite suppliers of accessories is renwil.com. They offer stylish collections of accessories that can be found at various shops throughout the GTA. Additionally, these finishing touches can also revive a space. With accessories your space can be transformed and used as somewhat as a disguise from its flaws. Adding accessories is like adding the makeup and jewelry to a space and highlights its key areas. As a designer there is nothing more exciting then hearing how a client loves their space and how it speaks to them and exudes their personality. Follow a few of my tips on how to select the best accessories for your new or existing space. Add color, a monochromatic space will lack personality, incorporate muted tones that work together or choose two bolder colors and distribute them across your space with accessories. Place these colors in varying accents like pillows, blankets, vases, & artwork. Ideally you draw these colors from a key piece in the space which could be an accent fabric, area rug, piece of art. When selecting accents ensure you use varying sizes. Groupings are often most successful when combining 3 different heights, widths of objects together. If you want to make a statement, add one or two large items to your space that will draw attention to them. A large painting on canvas would make an impact on a large wall. Pull out some of the colors in that painting for your accessories to distribute across the room. Add depth and dimension to your space by combining various textures. Keeping in your color scheme, combine items that are rough, polished, woven and silky. This adds interest without the need to add a lot of color. Create a dynamic space by adding contrast. The key to create contrast is selecting a few key pieces that stand out against the neutral backdrop of the rest of the space. Possibly you have a fireplace clad with a dark stone or slab; distribute the same dark tone found in the fireplace material across the room in a few key areas to unite the furnishings with the fireplace. Embrace change, as we are constantly evolving, don’t assume your décor shouldn’t. Once you have found a few key accents that add personality to your space don’t be afraid to experiment by re-positioning these items in your space for a fresh new look. Kate Davidson is the principal designer of Kate Davidson Design Inc., a multi-disciplinary firm offering interior design services for residential, corporate, retail, medical and educational spaces. A graduate of OCAD University’s Environmental Design program, Kate’s passion, talent, and expertise have contributed to her success as one of Ontario’s leading designers. Known for her sophisticated and contemporary interiors, she has a diverse background from high-end residential interiors to modern commercial design, set design and fine art consulting. Actively involved in the design community, Kate is on the Professional Advisory Council and is a speaker for Sheridan College’s Interior Decorating Program. 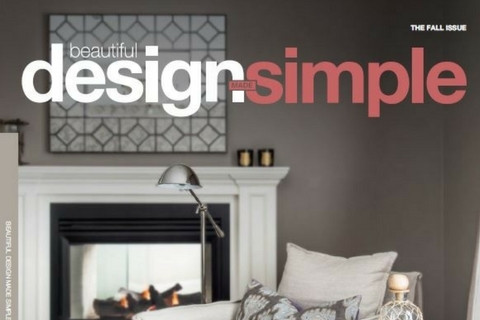 In the media, Kate was featured as a guest expert on the Marilyn Denis show, Buzz Buzz Home and CHCH Morning Live and is an annual speaker at various GTA Home Shows. Kate also has a monthly column “Inspired Living” in the Toronto Sun and frequently contributes to various design blogs, newspapers, magazines and publications. To view more of Kate's design work, visit www.katedavidsondesign.com.